Despite a spacious cabin and comfortable ride, the 2012 Chevrolet Impala is outdone by most competitors. You can do better. The 2012 Chevrolet Impala gets a new 3.6-liter V6 and six-speed automatic transmission along with slightly revised front and rear styling. All Impalas also now feature Bluetooth and a leather-wrapped steering wheel as standard, while the LT's standard equipment list loses foglights but gains a rear spoiler, flip-and-fold rear seat and leather-wrapped shift knob along with a sunroof option. Simple controls; available six-passenger seating; large trunk; strong and efficient engine. It's been six years since the Chevrolet Impala last received a significant update, and even longer since it was redesigned from the ground up. Since then the segment has been flooded with competitors with more style, substance and sophistication than Chevy's venerable four-door flagship. In fact, even Chevy's own Malibu is a more appealing choice. That's not to say the Impala is a bad car that'll leave you stranded by the side of the road or with a repair bill the size of Texas. It's certainly spacious and reliable, but nonetheless there are an awful lot more appealing choices out there that meet those criteria as well. There is some good news for 2012 as the Impala gains a new, more powerful and more fuel-efficient 3.6-liter V6 engine. Paired to a new (for the Impala) six-speed automatic transmission, Chevy's full-size sedan finally has a modern powertrain. Unfortunately, the rest of the car can't claim the same modernity. Its stale styling, cheap-feeling interior materials and lack of many desirable features make the Impala seem impossibly behind the times. 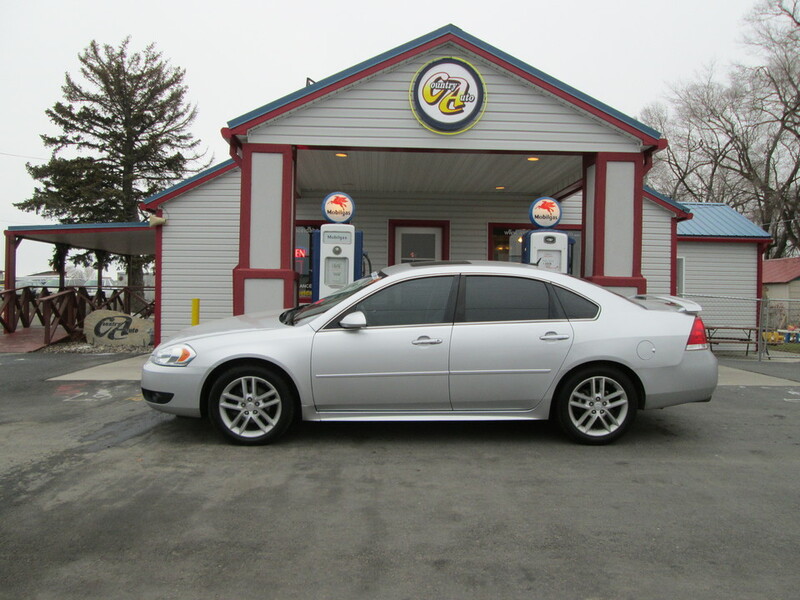 Overall, we'd strongly urge family sedan shoppers to consider any of the Impala's much more modern competitors, including the Buick LaCrosse, Chrysler 300, Dodge Charger, Ford Taurus, Hyundai Azera or Volkswagen Passat. Any of these would be a substantially better choice than the 2012 Chevy Impala. The 2012 Chevy Impala is a full-size four-door sedan offered in three trim levels: LS, LT and LTZ. Seating for five people is standard, but an optional front bench seat offered on LS and LT models bumps passenger capacity to six. Standard features on the entry-level LS include 16-inch alloy wheels, automatic headlights, keyless entry, cruise control, full power accessories, air-conditioning, a six-way power driver seat, a tilt-only leather-wrapped steering wheel, OnStar, Bluetooth and a six-speaker sound system with a CD player, satellite radio and an auxiliary audio jack. Stepping up to the LT gets you 17-inch alloy wheels, a rear spoiler, remote ignition, dual-zone manual climate control, a folding rear seat, a rear center armrest, a leather-wrapped shift knob, and a trip computer with compass and outside temperature display. The top-of-the-line LTZ adds 18-inch alloy wheels, foglamps, heated mirrors, leather upholstery, heated power front seats (eight-way driver, six-way passenger), an auto-dimming rearview mirror and an eight-speaker Bose premium audio system. A sunroof is available on the LT and LTZ. The front-wheel-drive 2012 Chevrolet Impala gets a new 3.6-liter direct-injection V6 that puts out a healthy 300 horsepower and 262 pound-feet of torque. A six-speed automatic transmission is standard. Though this powertrain is significantly gutsier than either of the V6 engines it replaces, the Impala's fuel economy has actually improved a bit. EPA estimates are a strong 18 mpg city/30 mpg highway and 22 mpg combined. The 2012 Chevrolet Impala's list of standard safety features includes antilock brakes, traction and stability control, OnStar telematics, front side airbags and side curtain airbags. The Insurance Institute for Highway Safety awarded the Impala the top ranking of "Good" in both its frontal-offset and side-impact tests, but the second-best rating of "Acceptable" in the roof strength test. One look inside the 2012 Chevrolet Impala's passenger cabin is all it takes to understand the car's strengths and weaknesses. On the plus side, the interior is roomy with seating for up to six passengers -- something that's increasingly hard to find these days. Gauges and controls are also well laid out and uncomplicated -- it's a potentially refreshing difference from the sea of buttons and complicated control interfaces common of most modern cars. Unfortunately, that's where the good news ends. Those controls are simple because they're attached to fewer features than are available on competitors. Furthermore, the cabin design is pretty stale and consists of subpar materials that are well behind GM's more recent offerings. It's a similar trade-off in terms of cargo room. The 18.6-cubic-foot trunk is certainly generous, but its folding rear seat is optional and lacks the more common 60/40 split design. From behind the wheel, the 2012 Chevrolet Impala gets mixed reviews. The new 300-hp V6 under the hood is a distinct improvement over either of the two uninspiring engines that previously occupied that space. With an additional 90 hp on tap, this powertrain delivers competitive acceleration. The car's suspension also gets high marks for ride comfort. There's a price to be paid for this plushness, however, and that's indifferent handling that leaves much to be desired. While this ride/handling balance might suit a few full-size sedan buyers just fine, most would be better served by the more capable and refined driving character of its competitors.